, bring the magic of fluidity and form to their artwork, whether it’s a telepathic performance, pop-up installation and, now, a collection of Google Live Cases. 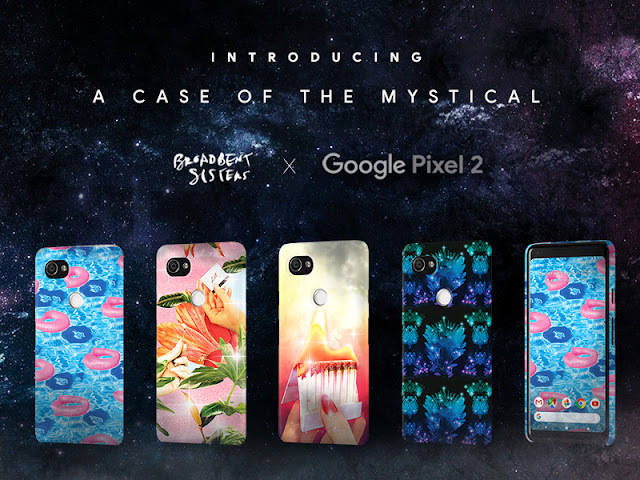 Today, Pixel fans from around the globe will be able to customize their own Pixel case by selecting one of 12 special designs that combine the Broadbent Sisters’ mystical artwork with a little bit of Google magic. We spoke with real-life sisters Joy and Rose Broadbent about where they find their artistic inspiration, advice for new artists on how to integrate technology into art and their collaboration with Google. Tell us a little more about your art and where you find your inspiration. We delve into any medium that feels right, whether it is painting, performance, sculpture or film, to transform everyday objects and spaces into magical and nurturing realms. Our unfolding art practice, ‘Clearing Spaces’ explores themes of ritual, meditation, pop spirituality and ecofeminism. We find collaboration to be an exciting and unique venue for distilling the essence of form and creating complex and relatable work. We find inspiration everywhere we go, from a discarded five dollar bill on the ground that becomes a giant painting, to the vast desert landscape in Arizona that becomes a series of short films. Tell us a little a bit about the Live Cases. How did you create your designs / select which pieces to turn into Live Cases? All of the cases feature elemental imagery, each interwoven with fire, water, earth or air. The images and objects begin to transform and melt into each other, creating hypnotic patterns and forms. Bright colours are used to ignite feelings of sensuality, power and femininity, and have an illuminated quality. There is a sense of alchemy and ritual in each case, creating a mystical mood. All of the cases are digitally rendered - what began as a photo or painting, transforms into glitched technological magic. We actually used the Pixel 2 phone to take photos of our hands performing different actions, as well as capture our original artwork. The final twelve cases reflect themes from our unfolding ‘Clearing Spaces’ practice. Do you have a favourite Live Case? Rose: Yes! My favourite case is the vibrant glitched volcano. I can’t wait to have this on my phone! This strong image represents feminine power and sensuality to me. The colours and mesmerizing lines seems to magically vibrate. I loved creating this case, as it was an intuitive and effortless piece. Joy: My favourite is the hand holding the matchbook on fire. I like the funny illusion of the hand being the same size are your hand holding the phone. Fire is my Leo element, and I am drawn to its warmth and passion. This image looks faked, but it is truly an original photo of Rose holding a matchbook on fire! How has technology changed your work as an artist? Technology has allowed us to share our work on an international platform. Social media specifically has created a virtual gallery space for us to connect to viewers everywhere. Technology also grants us opportunity to create more spontaneous work, using the phone as a mobile medium. We were able to take the photos for the Live Cases using the Pixel phone without having to laboriously set anything up. It keeps us agile and allows for uninterrupted, magical moments of flow. We use the computer in a lot of our work to create digital collages that help transform traditional photos into surreal worlds. This technological collaboration between human and device, creates new unique and unfolding forms of art. What advice would you give to young artists starting out on how to integrate technology into their work? Technology is the new tool for networking and showcasing your work. If you don’t have gallery representation, use social media as your platform. Make sure to enjoy the playfulness of technology, it seems to have a mind of its own and can add a strange mathematical magic to your work. Documentation is a huge part of the process in art making, make sure to continuously take photos and videos of your process, this becomes valuable in your overall practice. Now that you’re members of #teampixel, what do you love most about your Pixel 2 smartphones? We love the camera quality! The freedom to make good quality work with your phone means you can be in flow and capture moments you might have otherwise missed. We recently created a ‘Telepathic Film’ in two separate locations using the Pixel 2, which will be released this summer! Get your very own customizable Broadbent Sisters Live Case on the Google Store today, while supplies last. The case is available for $50 (CAD). For more BroadBent Sisters Live Case updates and surprises, search for #teampixel and #BBSxGooglePixel. 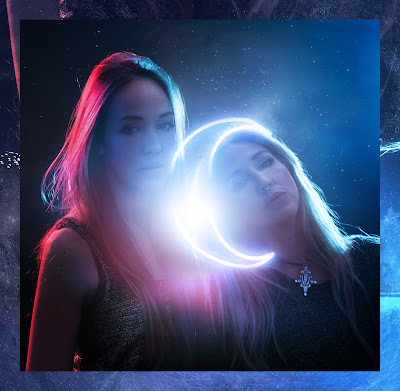 Toronto-based art duo, The Broadbent Sisters, bring the magic of fluidity and form to their artwork, whether it’s a telepathic performance, pop-up installation and, now, a collection of Google Live Cases.